Shakespeare's famous villain Iago took a moment to describe the love of his life, and with it, the nature of understated beauty. Natuzzi Italia has lent his namesake to a creation singular in austere and muted elegance. Iago is the opposite of ostentatious. Devotion, loyalty, ardor, all feelings evoked by the name Fidelio, a loose translation of Fidelity from Italian. Also the way you are likely to feel about this remarkable piece of contemporary furniture, a piece that will literally transform the way you experience your modern living space. The history of the modern recliner begins, of all places, in the pilots lounge of an American aircraft carrier, where officers reclined in leather chairs that tilted back, designed to put them at ease before a taking off into combat. The designer later adapted these seats to carry men to the moon. 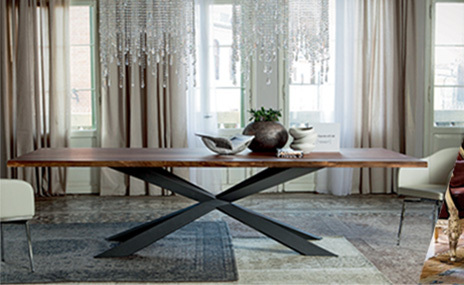 The very name Skorpio dining table is provocative. It conjures a myriad of images from Zodiac signs to 70's action films. It's a flashy contemporary moniker that's not afraid to grab the attention of the discerning customer; not unlike the table. This piece races past traditional design composition to set a new place for itself in your home decor. Remember those amazing bedroom scenes from classic films? Whether it's Dustin Hoffman kneeling behind Ann Bancroft on what looks like her daughterвЂ™s bed in The Graduate, or Audrey Hepburn sprawled out on the bed of her Manhattan flat with her orange cat perched on her back. The noble Borghese family of Italy is inseparably associated with the upper echelons of renaissance Roman society. This aristocratic agnomen appropriately suggests luxury, intricacy, and great worth. 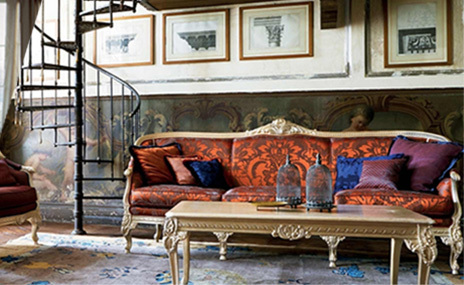 Like a great European family, the Borghese sofa evolves, adapts, and yet, in an essential way, remains exemplary.